Each writer has his or her own process, but discovering that process can take time. In the early phases, an excess of solitude can lead to a lack of accountability, and a lot of WIPs simply stay that way. The rise of online writing communities has made it far easier to avoid this trap. If you can’t find a critique partner or a workshop in your area, then you can certainly find structure and feedback online. But this also means knowing which voices to honor and which to reject. Online or offline, it’s important to respect criticism and the realities of the market while at the same time preserving the integrity of your work and your voice. First, let’s make one rule clear: An agent or an editor should never be the first person (other than you) to see your manuscript. When you’ve worked on a project for a long time, the story lives in your head as much as it does on the page. You need fresh eyes to catch small things like typos and gaps in information, and larger things like problems in pacing or failed emotional beats. Sometimes you can sidestep this problem by working with writers outside of your genre. You may also get some surprising perspectives on your work. I have a television writer and an academic in my arsenal of beta readers and sometimes they nudge me in unexpected directions. There are also plenty of people who don’t write, but who make great readers. They simply get the fundamentals of story and know how to suss out the weaknesses and strengths of your work. This might be a freelance editor that you hire or the friend who always comes out of a movie saying things like, “It dragged in the second act” or “I just couldn’t sympathize with the heroine after she ate that puppy.” As long as your readers can articulate what worked or didn’t in your manuscript, you’re set. But “I liked it” or “I hated it” aren’t going to do you much good. I’m going to address this to YA readers and writers, but it’s really applicable to any genre. A reader who doesn’t read a lot of YA can still be an asset — provided he or she understands what you’re trying to accomplish and can appreciate your work for what it is. But if the reader hates romance or coming of age stories or only reads memoirs or hard sci fi, you’ll probably end up with a critique of your genre as opposed to a critique of your work. Still, it’s wise to be a bit wary when you get deep into the YA world. People who write YA and write about YA tend to have very strong opinions about YA. (I know because I’m one of them.) The problem arises when we start to get dogmatic in these views: I hate gorgeous heroines! I’m sick of love triangles! I’m tired of dual POV! Sometimes, as readers, we react to the mere existence of a trope, and we dismiss the way that trope is being used or approached. I hear these statements from writers all the time, and I’ve made them myself. But when we get or give critiques, it’s important to draw a line between personal preferences and narrative merit. Similarly, I’d like to offer a word of caution regarding broad pronouncements about the YA market. If you chase trends, you will always find yourself a step behind. Be aware of the market. Understand that if you’re pitching a vampire urban fantasy, you better have one hell of a fresh hook. Just remember that no one knows what the next big thing will be. The value of the feedback you get from your readers is somewhat determined by how you approach them and how you treat their criticism. The I’m Stuck Read: You know there are problems with a major element of the story (the big battle scene, the love interest, the overall structure, etc. ), but you don’t know how to resolve them. The Line Edit: You’re done with the story and don’t intend to make fundamental changes. You want your reader to identify typos, grammatical errors, awkward language, word repetition. The release of information in a story can be one of the thorniest things for a writer to manage. This is particularly true when it comes to complicated plotting or world building. Once readers have seen your story, they can’t unsee it. They will never have the experience of bringing truly fresh eyes to the work again, so try to keep a reader or two in reserve. These readers haven’t had you bounce ideas off of them. They’ve never seen an early draft. They’re the closest you will get to the way an agent or editor will approach your work. Listen quietly and don’t get defensive. 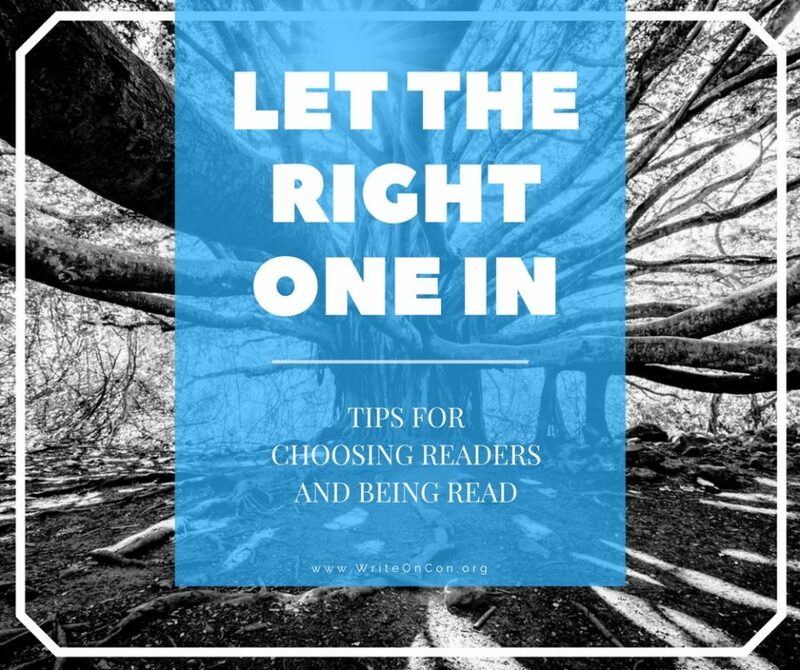 Once you’ve selected your readers, it’s your job to respect their feedback. Don’t just react or dismiss. Give each note its due. Let the ideas sit for a while before you decide whether or not to take them to heart. Have faith in your ability to address the difficult or frustrating critiques. You chose these people. You let them in. Trusting them is just another way of showing that you trust yourself. Editor’s note: Much of the old conferences’ material has sadly faded from the internet, so we’re bringing back the greatest hits! This post (originally from AUGUST 14, 2012) is one in a series of best events from previous years. Enjoy!